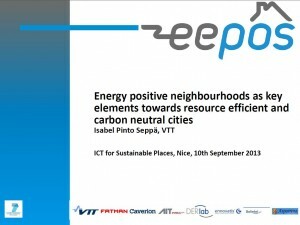 The focus is on the contribution of EEPOS FP7 project for realizing energy positive neighborhoods by developing open integrated urban neighbourhood energy management and decision support systems in which local consumers & producers as well as the main electrical and heating grids will be integrated. New business models and ICT-based tools for energy management systems at neighbourhood level. New Tools for engagement and motivation of users utilising new approaches as social media, serious gaming, or crowd sourcing. Isabel Pinto Seppä (VTT, Finland) has key expertise in technologies and services in the Sustainability of the Build Environment and in the fi eld of Forest products industries. Current research is focused on Energy effi cient buildings and neighbourhoods, and on eco effi cient product solutions. She is/has been involved in domain projects such as EEPOS (Energy positive neighbourhoods) and MEEFS (multifunctional EE façade system for building retrofi tting) and, in coordination actions for research roadmaps on ICT for energy effi ciency (REEB and ICT4E2B Forum). The population living in urban areas is projected to grow by 75% during the next 40 years. The UN estimated that urban population will grow from 3.6 billion in 2011 to 6.3 billion 2050. This brings challenges on safety, security, mobility and increasing resource consumption, including energy, among other demands. The global challenge is to reduce environmental impact and carbon footprint. Decisions made now in preparation for these challenges are crucial for the future of these urban areas, keeping the citizens’ well-being and the cities’ global competitiveness. Expenditures on improving energy effi ciency, modernizing infrastructure and on creating high quality living environments are enormous. At the same time, cities have limited and less fi nancial and human means. In this context smart energy management in buildings and neighbourhoods are key elements for maintaining people’s well-being with resources effi ciency. One of the key issues is the smart integration, management and operation of energy supply and demand. In addition the optimal use of local and renewable energy sources is important. These are within the scope of “smart city solutions”. Holistic solutions based on the integration of advanced ICT, energy and construction technologies and, addressing sustainability and energy effi ciency at building, district, and city levels will deliver added value cities towards carbon free cities. The key are open systems that open the data also to business innovations without high costs and utilises advanced system designing as dispersed concept with open interfaces. This is the core of EEPOS, research and development project funded by the EC under the 7th Framework Programme. New business models and services. Information and decision support system for optimising the use of energy beyond the buildings. Collaboration tools for engagement and motivation of users utilising new approacheslike social media, serious gaming, crowd sourcing etc. The EEPOS system will be validated in two extensive field tests in Finland and in Germany as well as in a complementary laboratory tests in Germany and simulation based virtual prototype study for the municipality of Asparrena, Spain. The project consortium includes eight academic, industrial and public organisations from four European countries located in different EU climate zones They combine unique expertise in building services, building management systems, energy effi ciency services, enduser needs and interfaces, renewable energy systems, monitoring and energy effi ciency focused productivity tools.